September Newsletter, Shakespeare and Company, Paris. If you are lucky enough to be in Paris in September check out what events are on at Shakespeare and Company. Festival America at Vincennes with author signings at our stand. September is la rentrée littéraire when all French publishers release some of the most exciting titles of the year – here at	Shakespeare and Company we’re buoyed up after a long warm August recommending books and flitting off to the sea at weekends. This month we’re collaborating with one of Paris’s biggest festivals, concentrating on American literature, Festival Americafrom 20 – 23 September. Celebrating its 10th anniversary, the festival hosts over 70 authors from over 13 countries. There will be readings, discussions and debates on a range of subjects, as well as writing workshops, films, concerts and art exhibitions. Authors	participating include Toni Morrison, Wells Tower, Karen Russell, Aleksander Hemon, Patrick deWitt, Teju Cole and Vendela Vida and we will be the only stand selling books in English – all anglophone writers will do signings at our stand – so come and visit us! To get you into the spirit, see our book recommendations below from authors attending Festival America. We’re thrilled to announce the forthcoming release of Shakespeare and Company: A Brief History of a Parisian Bookstore, a booklet chronicling the history of the shop. We delved deep into the bookstore’s archives to find the most gorgeous photographs, compelling historical documents, and terrific anecdotes–collecting them together in this single, exquisite volume. It’s a taster of the larger book we will publish early next year. The booklet includes an essay by Sylvia Whitman (owner	of the shop and daughter of founder George Whitman), along with writing from Lawrence Ferlinghetti, Anaïs Nin, Tumbleweeds, and Allen Ginsberg, who penned a poem extolling George Whitman and the store. The booklet debuts mid September, but we’re taking pre-orders at the website now – and the first 500 copies purchased through the site will be signed by Sylvia and inked by the Shakespeare and Company stamp. Don’t delay! Don’t forget if you are unable to come to a particular event and want a signed copy of one of the author’s	books (we can also post it to you) please email Alice. Most events take place upstairs in the library (seats 40), on the ground level (seats 50) or outside in front of the bookshop. The sound from the reading and discussions are	projected around the entire bookshop during the events. We recommend you arrive 15– 30 minutes early to try to get a seat as there is limited space. In spring 2011, Anthony Shadid was one of four New York Times reporters captured in Libya, cuffed and beaten, as that country was seized by revolution. When he was freed, he went home. Not to Boston or Beirut where he lives or to Oklahoma City, where his Lebanese-American family had settled. Instead, he returned to his great-grandfather’s estate in Lebanon, a house that, over three years earlier, Shadid had begun to rebuild.House of Stone is the story of a battle-scarred home and a war	correspondent’s jostled spirit, and of how reconstructing the one came to fortify the other. Shadid creates a mosaic of past and present, tracing the house’s renewal alongside his family’s flight from Lebanon and resettlement in America. He memorializes a lost world and provides profound insights into this volatile landscape.House of Stone is an unforgettable meditation on war, exile, rebirth and the universal yearning for home. Come for a *brief signing* by Ron Rash, award-winning poet, short-story writer and novelist. His most recent story collection, Burning Bright, won the 2010 Frank O’Connor International Short Story Award and his novel, Serena, was a New York Times bestseller and the movie based on this will premiere in Cannes next May. His latest novel, The Cove, is a gloriously dark work of historical fiction set in the Appalachian	mountains (Irving Welsh has just written the screenplay). ‘appears to derive quiet, almost religious, pleasure in descriptive clarity, so that sentences become little paradigms of the events they describe … because of its simplicity, the hard won elegance of its telling, it stays singularly in the mind after it has finished’ – Tim Adams, The Observer. Noel Riley Fitch, Rick Tulka and John Baxter will discuss the Paris café and its central role in art and literature. Why is the Paris café central to artistic history? How is the café portrayed in art and literature? What has the café offered the artist? What historical events have occurred in cafés? Why are its numbers diminishing and what future can we foresee? Three distinguished panel members will discuss these and other questions: Rick Tulka, who has drawn the clientele and staff at the café Le Select almost every afternoon for over 17 years; Noel Riley Fitch,	author of three books on the history of cafes, including one with Rick Tulka (Paris Café: the Select Crowd); and John Baxter, author of The Most Beautiful Walk in the World: A Pedestrian in Paris. Music, rhythm and stories for kids: Bring your children (2-6 year-olds, siblings welcome too) to the library at Shakespeare and Company for an hour of music, songs and stories in English (for all nationalities even	those who don’t speak English!). Led by the magic Kate Stables, mum and singer/songwriter from This is the Kit. There will be instruments to play and noise to make! 4 euros donation appreciated. The September edition of Philosophers in the Library will centre on the roots, troubles and redemption of American democracy. Led by Lex Paulson – a veteran of the Obama campaign and author of the “Applied Classics” series, who’s currently pursuing a philosophy PhD at the Sorbonne–the talk will explore the subject with the help of two illuminating texts, Polybius’s Histories and Alexis de Tocqueville’s Democracy in America. A Greek captive in 2nd-century BC Rome,	Polybius wrote the seminal account of how Rome’s balanced constitution accelerated her conquest of the known world; Rome’s republican system, in turn, was the primary influence upon America’s founding generation as its new republic was born. De Tocqueville, a young French aristocrat sent to study American prisons in the 1830’s, produced instead the most insightful, readable, and enduring account ever written on America and its civic life. What light do these ancient texts shed on the campaign of 2012? Can American democracy, for all its dysfunction, still be saved? Copies	of the two texts will be available ahead of time (in the library? behind the front desk?). See you in the library! Undoubtedly one of the most complex and intricate plots I have ever come across, and any attempt to summarise here would be futile. Suffice to say Nicole Krauss manages to weave together several strands which connect an old man in search of his son and a young girl searching for a cure to her widowed mother´s loneliness. It is a long lost book “The History of Love”, which is at the	centre of all the parallel texts which are woven together into a dense and rich tapestry. It is stylistically very inventive and Krauss´s writing is instantly addictive, tender and precise. Unusual, imaginative and in the end deeply moving. A superb novel. 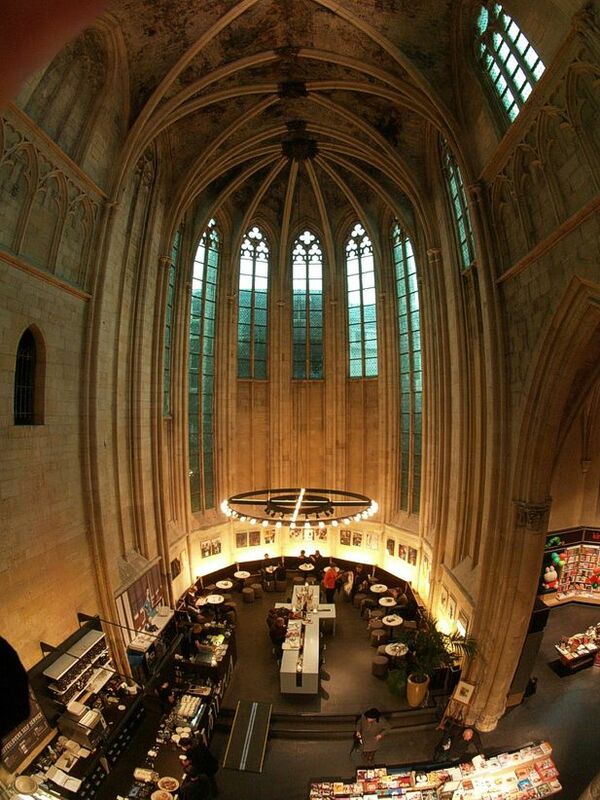 The Selexyz Dominicanen bookstore in Maastricht is a 13th century gothic architecture becomes a bookstore through continuos dialogue between history and modernity. In Maastricht, Selexyz Dominicanen is a project with multiple souls, where tradition and innovative solutions come together over a good book and a good cup of coffee. In the Classical world, Mercury, the god of merchants, was also considered the messenger of the gods and the protector of swindlers. Since then, trade has been traditionally labeled as “amoral,” a notion that gained ground during Christianity, when St. Nicholas was named the patron saint of thieves and merchants and St. Thomas Aquinas concluded that traders would be kept from entering the Kingdom of Heaven seeing that temptation figured as an integral part of their profession. The disorientation visitors encounter upon entering the Selexyz Dominicanen bookstore in Maastricht is likely atavic in nature. The building that houses the store is in fact a Gothic church consecrated in 1294 by the Order of Predicators founded by St. Dominic. The church has not hosted a religious function since 1794, when the church was confiscated by Napoleon’s army for military purposes. Since then, the space has been used as a town archive, warehouse and even an inglorious site for bike storage. In 2005, Boekhandels Groep Nederland (BGN) decided to give new life to the building by transforming it into what is now one of the world’s most incredible bookstores. The interior design by the Amsterdam-based firm Merkx+Girod Architecten creates retail space by taking advantage of the spatial magnificence of the church’s architecture. To satisfy BGN’s need for 1,200 m2 of selling space and given that the church’s floor area is of only 750 m2, Evelyn Merkx and Patrice Girod thought to insert an over-sized walk-in bookcase. The two upper levels therefore compensate for the lack of surface area, enabling the transversal use of space. The imposing bookcase created by Keijsers Interior Projects is positioned on the right side of the building, between the central and lateral naves, and encompasses the stone columns. A series of stairs lead visitors up the black steel walk-in bookcase, providing an up close and personal view of the vaults of the nave, enthralling them with a nearsighted view of the frescoes and revealing an unknown perspective. In stark contrast, the left side of the church retains the original height of the building with low tables placed parallel to the central nave as if to lead the visitor toward a sort of hypothetical altar. The left nave features low, horizontal tables and vertical book shelves along the walls to create thematic islands separated by the steady rhythm of the columns. The lighting, which is an all but integral part of the store’s design, manifests itself in the chorus by way of a traditional chandelier above the crucifix-shaped table located in the café area. Here, with the left side housing the bar area, a series of tables, poufs and armchairs mimic the curved line of the chorus to a raised platform. The Selexyz Dominicanen bookstore, for which Merkx+Girod was awarded the Lensvelt de Architect prize in 2007, welcomes about 700,000 visitors each year and showcases 25,000 books and 45,000 volumes. Writers around the world who have not yet published a book, now is your chance! More details can be found on the Shakespeare and Company website. The Paris Literary Prize is an international novella competition for unpublished writers. Any topic is welcome. Shakespeare and Company has a long-standing tradition of opening its doors to aspiring writers and in keeping with that philosophy, the 10,000€ Paris Literary Prize is open to writers from around the world who have not yet published a book. Last year, the winner of the Paris Literary Prize was Rosa Rankin-Gee for The Last Kings of Sark ; the two runners-up were Adam Biles for Grey Cats, and Agustin Maes for Newborn. The selection process for the Paris Literary Prize occurs in two phases. First, our dedicated team of readers (numbering 12 in 2011) goes through each submission in search of exceptional stories, voices and craft and a long list of roughly 10% of entrants is then chosen for closer inspection. After many hours of reading and debate, this is again reduced to form the short list, between 10 and 15 entrants. This is where our Jury takes over, spending a month with the texts before selecting the winner and two runners-up. To ensure the quality and diversity of the selections, each submission is considered by several readers (for instance, in 2011 each text was viewed at least five times). Erica Wagner will again be chairing the jury for this year’s prize, with the remaining members to be decided shortly. For the list of 2011 readers and jury go to the Paris Literary Prize site. 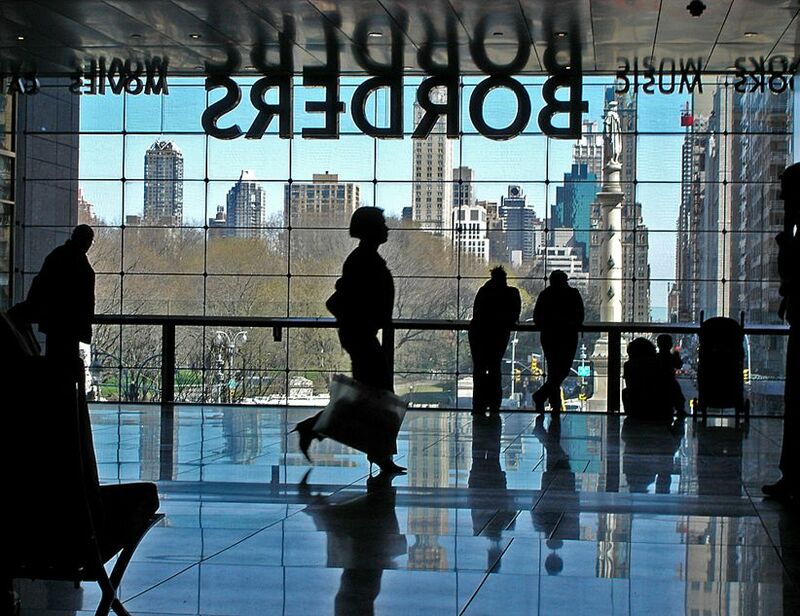 Borders, NYC in the Time Warner Center, overlooking the Columbus Circle and the Columbus Stature. This is a beautiful bookstore. Modern, with lots of light and space. 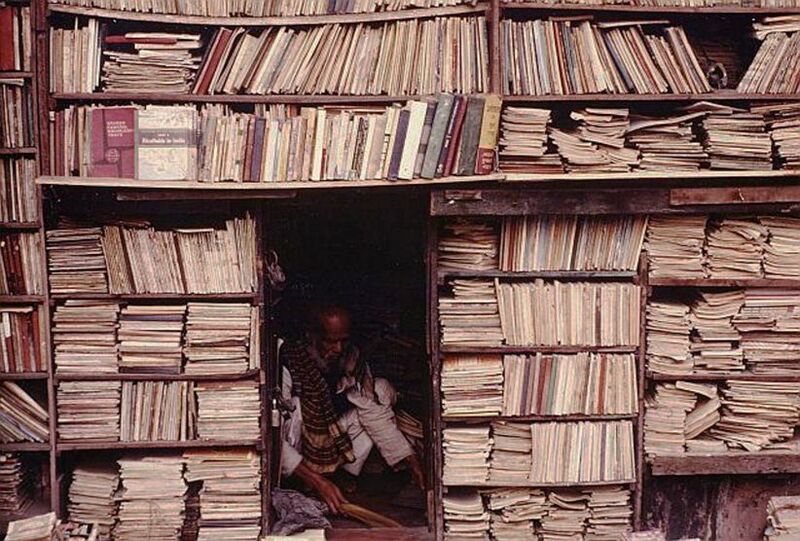 A cramped bookstore in Calcutta. I’d love to visit this bookstore. Imagine the treasures waiting to be discovered. I love old-fashioned bookstores and this is one of the most beautiful bookstores in the world. Shakespeare and Company is the name of two independent bookstores on Paris’s Left Bank. The first was opened by Sylvia Beach on 17 November 1919 at 8 rue Dupuytren, before moving to larger premises at 12 rue de l’Odéon in the 6th arrondissement in 1922. During the 1920s, it was a gathering place for writers such as Ezra Pound, Ernest Hemingway, James Joyce and Ford Madox Ford. It closed in 1941 during the German occupation of Paris and never re-opened. The second is situated at 37 rue de la Bûcherie, in the 5th arrondissement. Opened in 1951 by George Whitman, it was originally named “Le Mistral” but renamed to “Shakespeare and Company” in 1964 in tribute to Sylvia Beach’s bookstore. Today, it serves both as a regular bookstore and as a reading library, specializing in English-language literature. The shop was featured in the Richard Linklater film Before Sunset and in the Woody Allen film Midnight in Paris. Sylvia Beach, an American expatriate from New Jersey established Shakespeare and Company in 1919 on 8 rue Dupuytren. The store functioned as a lending library as well as a bookstore. Beach moved to a larger location at 12 rue de l’Odéon in 1921, where the store remained until 1941. During this period, the store was the epicenter of Anglo-American literary culture and modernism in Paris. Writers and artists of the “Lost Generation,” such as Ernest Hemingway, Ezra Pound, F. Scott Fitzgerald, Gertrude Stein, George Antheil and Man Ray spent a great deal of time at Shakespeare and Company, and it was nicknamed “Stratford-on-Odéon” by James Joyce, who used it as his office. Its books were considered high quality and reflected Beach’s own literary taste. Shakespeare and Company, as well as its literary denizens, was mentioned in Hemingway’s A Moveable Feast. Patrons could buy or borrow books like D. H. Lawrence’s controversial Lady Chatterley’s Lover, which had been banned in Britain and the United States. Beach initially published Joyce’s book Ulysses in 1922, which was banned in the United States and in the United Kingdom. Subsequent editions of Ulysses were published under the Shakespeare and Company imprint in later years. The original Shakespeare and Company was closed in 14 June 1940, during the German occupation of France during World War II. It has been suggested the store may have been ordered shut because Beach denied a German officer the last copy of Joyce’s Finnegans Wake. When the war ended, Hemingway “personally liberated” the store but, despite this, it never re-opened. In 1951, another English-language bookstore was opened on Paris’s Left Bank by an American George Whitman, under the name of Le Mistral. Its premises, the site of a 16th-century monastery, are at 37 rue de la Bûcherie, near Place Saint-Michel, just steps from the Seine, Notre Dame and the Île de la Cité. Much like the original Shakespeare and Company, the store became a focal point for literary culture in bohemian Paris, and was frequented by many Beat Generation writers, such as Allen Ginsberg, Gregory Corso, and William S. Burroughs. In 1964, after Sylvia Beach’s death, Whitman changed his store’s name to Shakespeare and Company in tribute to the original venture. He described the bookstore’s name as “a novel in three words”. and calls the venture “a socialist utopia masquerading as a bookstore”. Customers have included the likes of Henry Miller, Anaïs Nin, and Richard Wright. The bookstore includes sleeping facilities, with 13 beds, and Whitman claims as many as 40,000 people have slept in the shop over the years. Regular activities that occur in the bookshop are Sunday tea, poetry readings and writers’ meetings. Whitman’s daughter, Sylvia Beach Whitman, now runs the shop. George Whitman died at the age of 98 on December 14, 2011. George Whitman’s daughter, Sylvia Beach Whitman, has now taken over the day-to-day running of the shop, and continues to run the store in the same manner as her father, allowing young writers to live and work in the shop. She has also started a biennial literary festival, FestivalandCo, which has hosted such writers as Paul Auster, Siri Hustvedt, Jeanette Winterson, Jung Chang and Marjane Satrapi. Sylvia Whitman has appeared on the Paris episodes of The Late, Late Show with Craig Ferguson, which aired the week of August 1, 2011.